The Greeting Card Studio is a unique, easy to use card creation software that allows you to create your own individual greeting cards. The software is bundled with attractive, high quality images, borders and backgrounds and you can even insert your own pictures to make your cards come to life. Create Amazing Cards & publish/share instantly! Greeting card Studio provides you with freedom to create best printable cards and e-cards for special occasions. 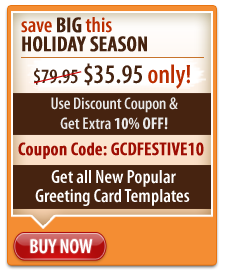 Create Christmas cards, New year cards, birthday cards, anniversary cards and many more occasions. You can also create Single page cards - a perfect fit for sharing on social networking websites like Facebook, twitter, Picasa etc. Express your feelings for your loved ones in 3 easy steps with greeting design software! Besides showing off your creative skills, the Greeting Card studio gives you big savings -you save on all the money that you would have otherwise spent buying expensive greeting cards. Now you never need to buy another card in your life! Fold your greeting card in a variety of ways-half fold, quarter fold, accordion style etc.